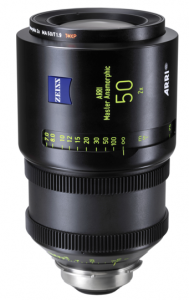 Carl Zeiss and ARRI have partnered for three-quarters of a century in a cooperative effort that is unmatched in the film industry. As we celebrate this commitment, ARRI is pleased to unveil our latest collaboration – the new ARRI/ZEISS Master Anamorphic lenses. Especially developed for the ALEXA Studio, ALEXA Plus 4:3 and ALEXA M cameras – all equipped with a 4:3 sensor and hence perfectly suited to true anamorphic capture – the Master Anamorphics expand creative op- portunities for today’s image-makers. These ground-breaking lenses are the first ana- morphic glass designed from scratch for modern digital cameras; however, they perform beautifully with analog film cameras as well. Seven high performance anamorphic primes (35 mm, 40 mm, 50 mm, 60 mm, 75 mm, 100 mm and 135 mm) comprise the lineup. The lenses are fast and compact, capable of shooting at T1.9, and most have a front diameter of 95 mm. The maximum lens weight is below 3 kg. The revolutionary optical technology features a newly developed iris with 15 aperture blades, while the near-telecentric optical design reduces color fringing and shading at the image corners. Virtually no image breathing and no anamorphic mumps (fat face effect) are experienced. A com- pletely new focusing mechanism overcomes time-consuming mechanical readjustments on set; state-of-the-art lens barrels feature improved dust and water protection. Anamorphic imagery is famous for striking bokeh. With the Master Anamorphics this is further opti- mized with evenly illuminated oval out-of-focus highlights. Anamorphic blue streak lines are ren- dered in a fresh style with enhanced flares and reflections for additional artistic options. The lenses are super color matched to other ARRI/ZEISS prime lenses. The Master Anamorphics rely on the same me- chanics and superior standards of the award-winning ARRI/ZEISS Master Prime lenses, which have brought them onto countless sets of me- morable, award-winning cinematic masterpieces such as Hugo, The King’s Speech and The Lord of the Rings trilogy. Earlier this year, the designers of the Master Prime range were honored with a 2012 Scientific and Engineering Award (Academy Plaque®) from the Academy of Motion Picture Arts and Sciences. The ARRI/ZEISS Master Anamorphic series continues this amazing legacy by offering outstanding image quality to more cinematic storytellers.